Hello everyone: This is another late post but this time it's because we went to the apple orchard with the kiddos, to pick pumpkins and apples and get lost in the darn maze, sheeesh!! It was a perfect day! We got back a while ago but we started racking some of the leaves on the front yard with them. The kids are back home and now it's again way to quiet, we miss the noise. 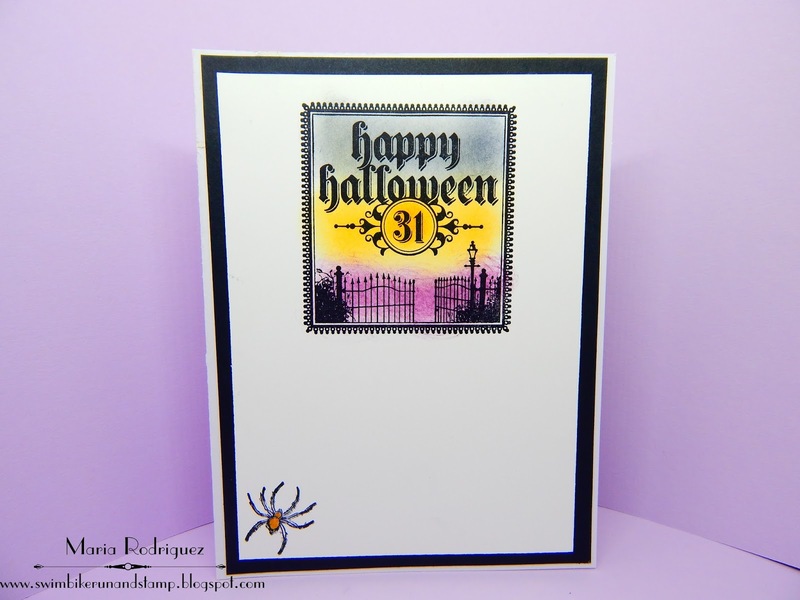 I'm having so much fun making Halloween cards with my 2 "new" fabulous stamp sets I bought just recently on Ebay. This card is made with both of this sets, the 2006 Stampin' Up! 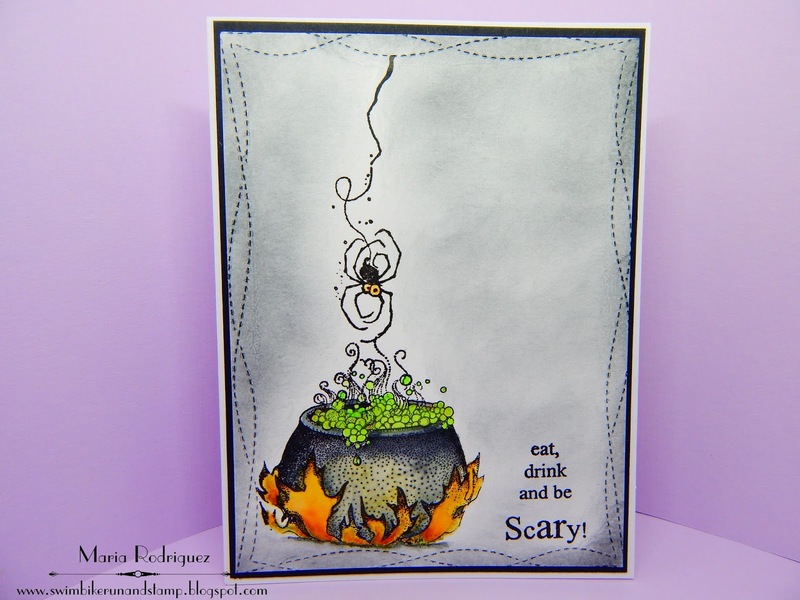 Halloween set "Best Friends" and the "Mostly Animals" set with these amazing Witch and Cauldron. This last one I don't know when it was issued, but when I Googled the name of the company, I found out on Splitcoaststampers that they went out of business back in 2004-2005, so thank goodness for Ebay because this stamps are over the top fabulous, just look at this awesome Witch. I think she is adorable in her own kind of spooky way, love that you can really put just about anything between her very long and perfectly manicured fingernails, I chose the spider from the "Best Friends" set just because I think it fits just right for what she's about to "cook?" I had to do a bit of masking for this card right there where her right foot is to put her like she is behind the boiling cauldron. I stamped all of this images with Versafine black ink on Strathmore mixed media paper and colored them with some SU markers and also Sakura Koi watercolors. I tried to make her recipe book look old and very well loved so I went with some markers and Prismacolor pencils giving it a stained appearance. Now, I was not going to put that black cat there but, as sometimes happens, I got a big smudge on my finished panel, I just about passed out so, I needed something to cover it and I remember the cat in the retired SU set called "Bite Me", which happened to be just about the perfect size for this scene, I stamped him on a separate scrap of watercolor paper with Versafine ink, clear heat embossed it and fussy cut it, Voila!! problem solved, phew!! Oh, I added a couple of small red Rhine Stones to his face just to make him look scary. 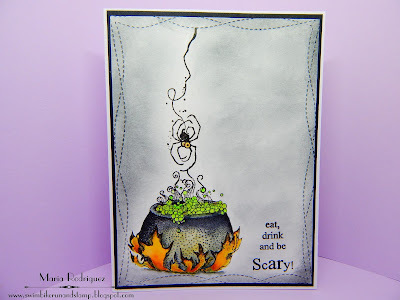 The spider webs are from my Halloween stash, the spiders are from the "Bite Me" set and the sentiment from another retired SU set called "Jar of Haunts"
I'm entering this card on this challenges. As You See It Challenge #161 "Delicious Shivers"
As You Like It Show Us Your Style "Do you prefer people or animals"
Well, I love both my animal friends and my human friends but, when it comes to color them, I rather color animals. 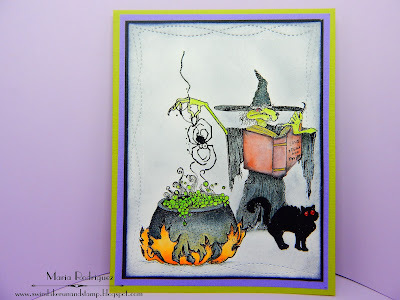 My Time To Craft Challenge #357 "Halloween or Cats"
The Fairy and the Unicorn Challenge #8 "Anything Goes, optional theme "Witching Halloween"
As you can see I chose the Witch. Hello everybody: This post is SUPER LATE!!!!! Been having mayor Internet troubles, this time it's NOT my computer, it's the darn WEB, 😡 Goodness!!! when it works it's awesome, when it's not.....well, you want to pull your hair out, there is literally nothing you can do but wait. I did found out there were doing some repairs outside my subdivision, ughhhh!! 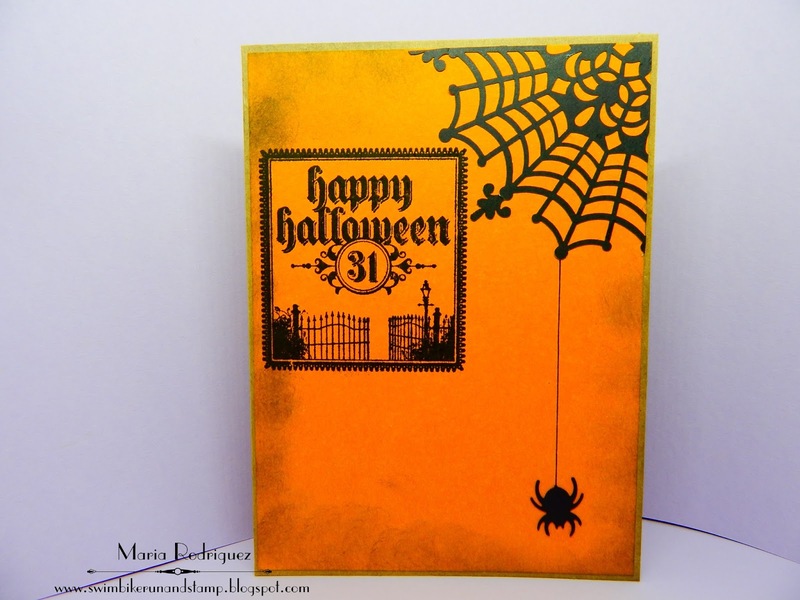 Anywho, I have another card I made with that FANTABULOUS and sadly retired Stampin' Up! 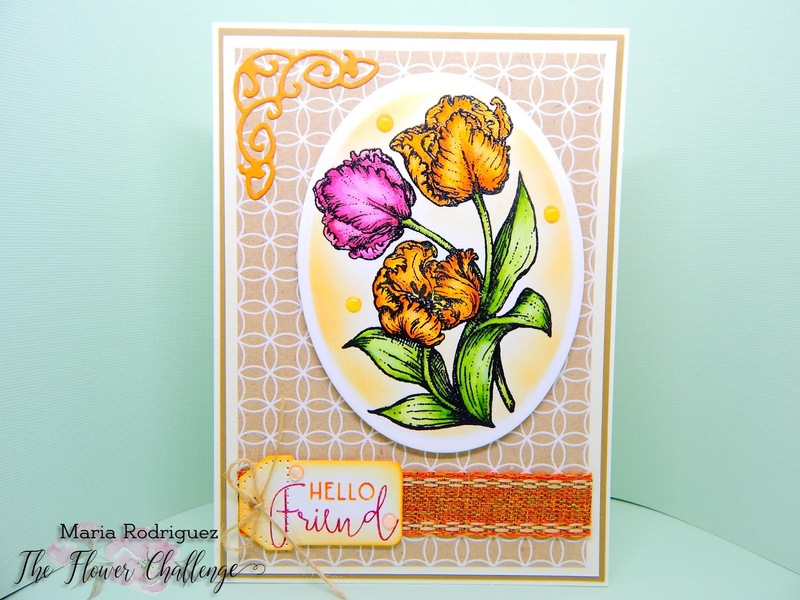 set called "Best Friends", that came out back in 2006, way before I started stamping. 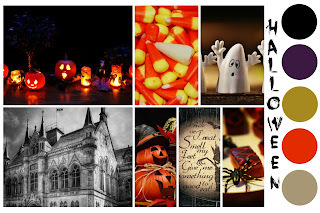 I saw a card on Pinterest and I fell head over heels in love with this awesome Halloween images. Ok, see what I mean? Mr. Dracula here is looking totally awesome, all dressed up for, what it looks like a date?? He even has a "beautiful" bouquet of eyeballs to sweep someone off her feet, oh my goodness!! I placed a googly eye on each of this eyeballs, sooooo much fun. I just stamped this image on Strathmore Mixed Media paper and colored it with some SU markers and Sakura Koi watercolors. 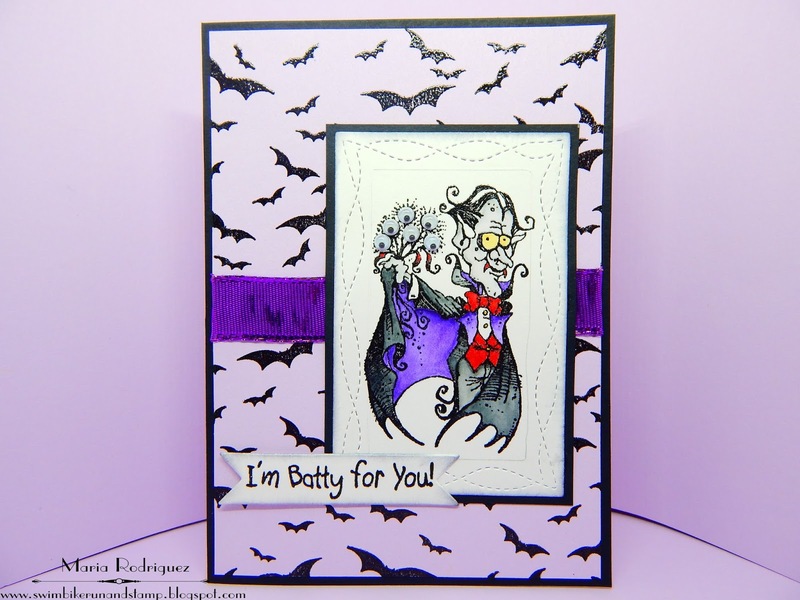 The background is done with a very batty stamp which is perfect for this card, I added a bit of ribbon and a sentiment from my stash. This guy needs nothing else. Here is a picture of the finished inside of this card, I've been finishing the inside of every card I make, it saves me a lot of time when I mail them. The sentiment and hanging eyeballs are from the retired SU set called "Jar of Haunts", I just placed it on the MISTI and went over these two eyeballs with a black SU marker. 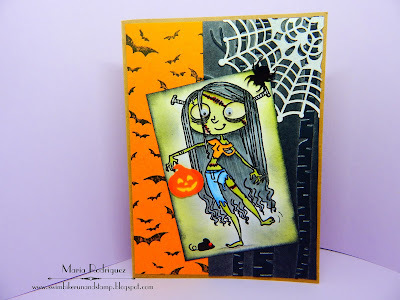 Deep Ocean Challenge #166 "Halloween"
Stinkin' Inkers Challenge "Monster Mash"
Cardz for Guyz Challenge #180 "Halloween or Autumn Thank You"
Hello everyone: Ok, this card is the FASTEST card I've ever made in my life!!!!! I mean, it took me literally 9 min. 43 sec. from start to finish. You might be wondering why I noted the time, right? Well, it's because of the As You See It Challenge #160 "Haste makes Taste". The thing here is to make a card under 10min. 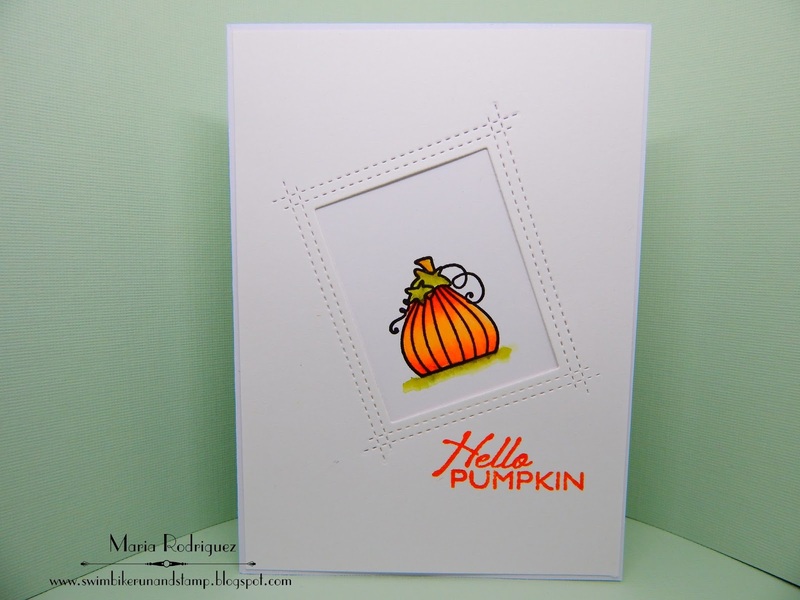 I actually entered THIS CARD to the challenge before but, when I read the comment from one of the DT ladies I discovered that the challenge was about making your card under 10min. so I wrote to her apologizing for not reading the rules and removed my card. 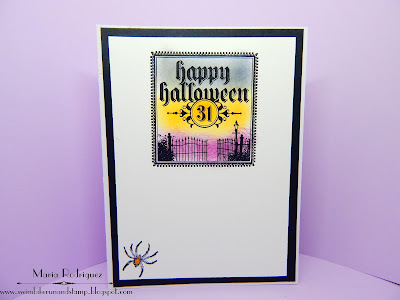 But I thought this was a fun challenge to enter so I decided to give it another try by making this card just this morning. 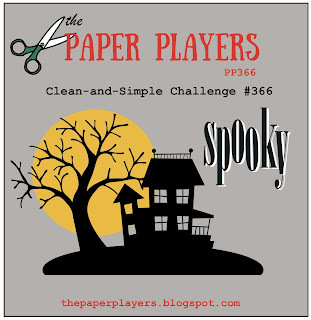 Ok, in the rules of this challenge you are permitted to assemble all of your materials, from paper to inks, stamps, colors, etc. The trick for me was to find a set that had all I needed to do this quickly and I found it on the Verve set called "Bountiful Harvest". I also have card stock panels already cut in all the colors just so I can have them ready when I need them. So, I set up my digital kitchen timer for 10 minutes, assembled all of my stuff, including the MISTI, on top of my table and went through the motions of what I was going to do. First, I "designed" this card in my head and, when I was sure everything I needed was near me, I started the timer and went to work, I honestly was nervous, can you believe it? LOL!!. First I die cut the front panel, then I stamped the pumpkin on a scrap piece of watercolor paper and the sentiment at the same time. I colored the little image rather quickly and assembled the front panel, with this done I went to work on the inside of my card. Here is a picture of the finished inside of this card, this also took me very little time, as you can see, it's super simple and I stamped both the sentiment and the leaves at the same time with the MISTI, glued the panels to the card base and BAM!! I was done!!! 9 minutes, 43 seconds, phew!! I'm entering this Fast Card in the following challenges. As You See It Challenge #160, "Haste Makes Taste", 9 minutes 43 seconds. Stamping Sensations October "Autumn Glory"
Use Your Stuff Challenge #284 "Tis The Season for Pumpkin Spice"
I inked up the Verve stamp set for the first time in a long, long time. 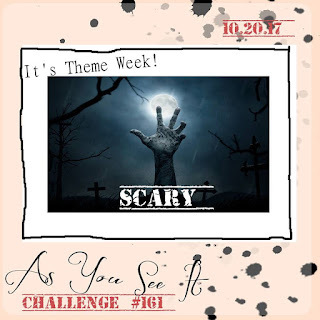 Artistic Inspirations Challenge #188 "Creepy or Anything Goes"
Hello everyone: There is a new challenge over at SHOPPING OUR STASH, this time we want to see ZOMBIES, WALKING CORPSES, ETC. we are trying to encourage you to add some fun Halloween cards to your stash so, here is my card and I hope it inspires you to join my teammates and me in the gallery. Ain't she gorgeous? she is from Krafting Kimmie but I'm afraid this particular stamp is discontinued, I bought it a good 5 years ago. So this time I did a mayor Shopping of my Stash to create this card. I used two leftover pieces of card stock, the one with the bats and the black one with the embossed Birch Trees from SU. The spider web in the corner is also from SU, I just cut it in half and then in fourths. The image is stamped on a piece of watercolor paper with Versafine ink and colored with Sakura Koy watercolors, I sponged a bit of Shabby Shutters and Black Soot distress inks all around this cutie pie. The spider on the corner and the pumpkin she is holding are, believe it or not, confetti. Here is a picture of the finished inside of my card. I always finish the inside to save me time when I need to mail my cards to family and friends. 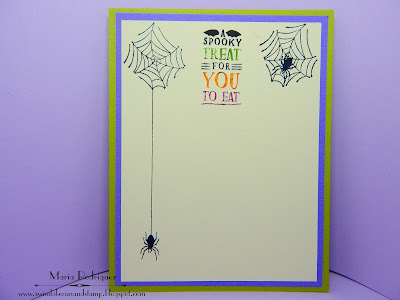 I used the other fourth of the cut our spider web and another little confetti spider, the sentiment is from a Stapin' Up! set called "Dark and Dreary", from the 2010 Stampin' Up! Holiday Mini. 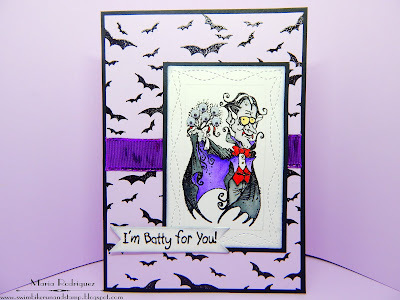 So come and join my teammates and me in the SHOPPING OUR STASH gallery, be sure to check out the rest of the cards the Designer Team created for your inspiration. Leave us your comments, we love to hear what you think. Hello everyone: Sometimes I wish I would have started stamping sooner than I did, which is back in 2010 more or less. 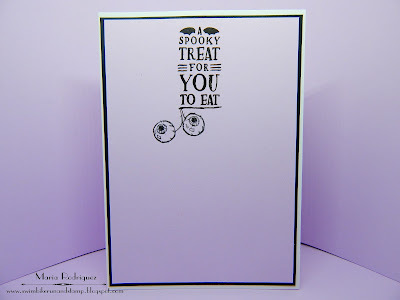 I often go to Pinterest for some inspiration which I always find but, I also find cards that totally stop me in my tracks and I sit here wanting to have the stamp set that was used to create them. If I'm lucky enough, the creator of the card gives the name of the set and that sends me on the hunt and, if it's current, it's easy to find but, when it's OLD, then it's more difficult. Ahh!! but I'm stubborn as.....and, when I want something bad enough, I'll move Heaven and Earth until I get it, maybe that's the IronMan in me, who knows but this is the case of this two images on my card, I saw them therefore, I had to have them, thank goodness for Ebay!!! Does any of you recognize this images? They belong to two different stamp sets. The Spider is from a 2006 Stampin' Up! set called "Best Friends", the Cauldron is from a set of two stamps from a company called "Just Animals", which I never heard of. Anywho, I wish I would have started stamping back in 2006 because I would have bought this set immediately but that was the year of my first Iron Man Triathlon so, all I did was train like crazy, every day for 10 months, which was great because I had a fantastic race. So, I stamped both this images on watercolor paper with Versafine black ink and colored them with some SU markers and Sakura Koi watercolors. I sponged some black ink around them to make some smoke, LOL!! the sentiment is from my stash. I'm going to be creating more cards with this fantastic images so I hope you can stop by the rest of the week to see them. The images here are both from a retired SU set called "Dark and Dreary" from the 2010 Holiday Mini catalog, love this images. The Paper Players, I hope the "smoke" still makes this card CAS. Dragonfly Journeys Challenge #113 "Halloween Hoopla"
Crafty Calendar Challenge October challenge "Halloween"
Hello everyone: Love Autumn and everything that it offers.....colors, weather, sweaters, pumpkin patches, baking and even racking gazillions of leaves. 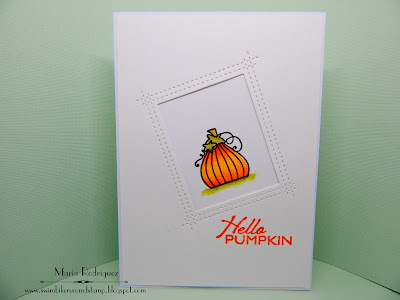 My card has some of my favorite pumpkin images from an old Flourishes set called "A Season of Thanks", I will link it to a few challenges at the end of this post. I stamped the image on a panel of watercolor paper with Stazon black ink and colored with SU markers. 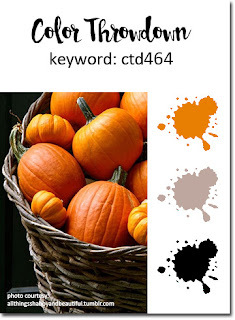 I love the retired Pumpkin Pie ink to color pumpkins, I don't think there is any other color that is as close as the real thing, thank goodness I have a reinker, which I treasure. The sentiment is from this set. Here is a picture of the finished inside of my card. I made a commitment back in January to always finish the inside, now I don't even think twice, this saves me a ton of time when I mail them. 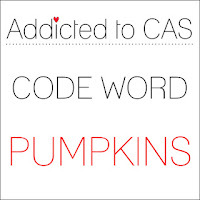 The sentiment and little pumpkin are also from this set, I just stamped the small pumpkin inking it with my SU marker. Alphabet Challenge "P" is for Pumpkins. 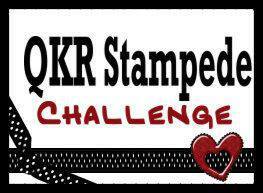 QRK Stampede Challenge #265 "Pumpkins or Anything Goes"
Crafty Friends Challenge #68 "Anything Goes"